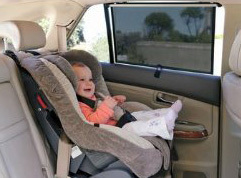 This Extra Wide Car Shade protects children from the Sun's damaging harmful rays and annoying glare all year round. Suitable for larger vehicles, SUV's & trucks. Easy to install with included strong suction cups and suitable for stationary or wind down windows. Extra Wide 50cm (19.5").